From performance standards to safety features, the process of buying a new or pre-owned car can be draining just thinking about it, and that’s not even mentioning the price haggling that often comes with the ordeal. That’s why at Baxter Subaru, we strive to make every experience as positive and transparent as possible. As the No. 1 dealership in volume and customer experience in both Nebraska and Iowa, we thank both longtime customers and first-time buyers for their continued support. Whether you’re searching for the stylish Subaru Legacy or the adventurous Outback SUV, our new Subaru inventory is stocked full of exciting new Subaru models. When you buy a new vehicle at our Omaha Subaru dealership, rest assured that you’re receiving a price that is listed at or below Kelley Blue Book's fair purchase value.1 Plus, as staples of the Omaha community for 60 years, we believe in giving back. That’s why every year we join the Subaru Love Promise that ensures you’re buying more than a price. This Subaru event is both nationally and locally focused, so when you purchase a new or pre-owned Subaru, know that a portion of the proceeds will go to an organization in need. If you leave our lot unhappy, rest assured that you'll be able to exchange your vehicle within 30 days with your trade credit intact.5 We want everyone to love their vehicle! We’re here to cater to your needs and make the car-buying process as beneficial as possible, whether that means you’re shopping from home, online or in another state. 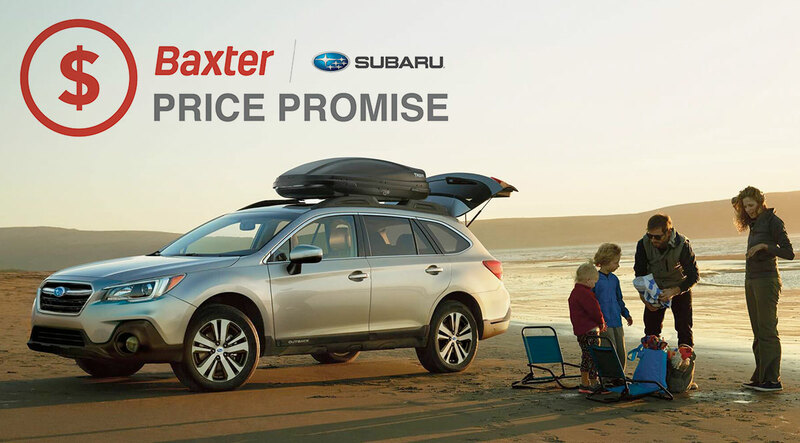 Stop by Baxter Subaru today! 1 New car pricing is subject to change within the same day and in some cases lower than the online price depending on market conditions.